Winch-hook, string, roller and stickers all may be acquired from Don Thompson at: ToyReplicas.com. Larry Chinn also has some great Crawler decals, I believe. eMail him for prices/availability. The next layer of commitment is the complete restoration. First, examine the Crawler for any broken parts or melts. If the melts aren't bad, you can sand them out using a lot of patience and elbow grease. Use the basic recipe that David Benz describes in his Plastic Scratch Instructions here. If the melt are bad and truly marr the vehicle, my recomendation is that you look for another one to restore. With unworking crawlers in the $10-20 range, it is worth spending a little to cut down the chore of replacing missing/melted body-parts. Be patient and one will come along...they frequently appear on eBay. Inspect and clean the battery contacts. Sometimes, the metal tabs need to be bent slightly to make contact with the batteries. Also, a little steel wool or fine grit sandpaper works like magic to ensure good contact with the juice (batteries). I've heard of MMM collectors either buying replacement contacts or making them from scratch. You can use metal cut from a tin-can, making sure you remove any plastic coating or paint, then bending to fit. Next, look at the wire connectors to see if the wires are still attached to the battery contacts. Many times these may be repaired with a little solder, if they are frayed or separated. 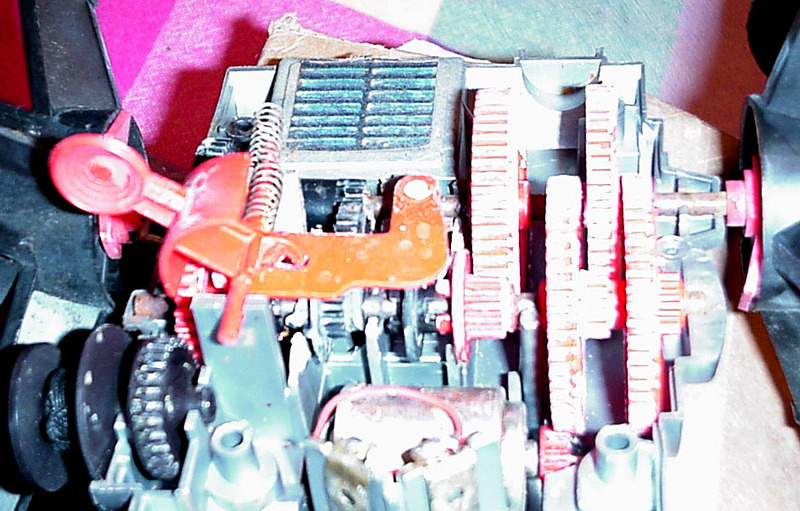 These wires may need to be replaced, but check the motor before you do (instructions in the bottom section). From here out, it's a matter of determining if you want to take the thing apart or not. For the Space Crawler, I feel to see if the spokes of the "wheels" have much play in them, and if they are off set and tight. If the Crawler gears are working properly, the spokes should hardly move, remain in "opposite" position (the spokes alternate when set properly), and you should hear the gears moving against one another, with a lot of resistance to their being moved. Also, look inside the winch lock to see if any of the gears are eaten away... this usually manifests as white powder, the residue of whatever lubricant was used on the gearing. As a note, the little "oil here" hole under the bottom is often the culprit of Crawlers not working... the petroleum lubricants that were common back in the 60's oft times have the effect to eating away at the plastic gearing. Usually, when this is the case, the "wheels" turn freely and simply won't grab, even if the motor still works. At this point, if everything "feels" good, you can take the chance of pulling the body apart. This is not for the mechanically inept! The Crawler is a mechanical design wonder, with many moving parts, that may be difficult to put back together when full dissembled. 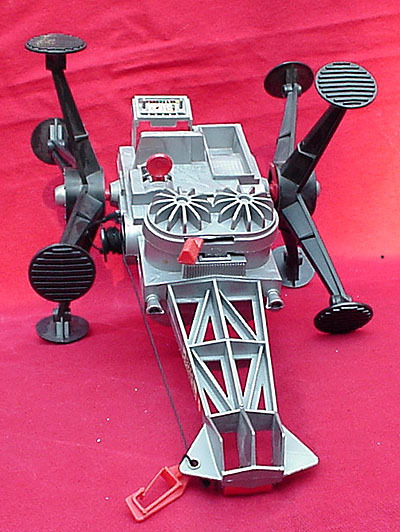 My advice is if the crawler seems "shot" .. it's much easier to buy one that works and sell the non-working one on eBay (to recoup the cost of the good one!). 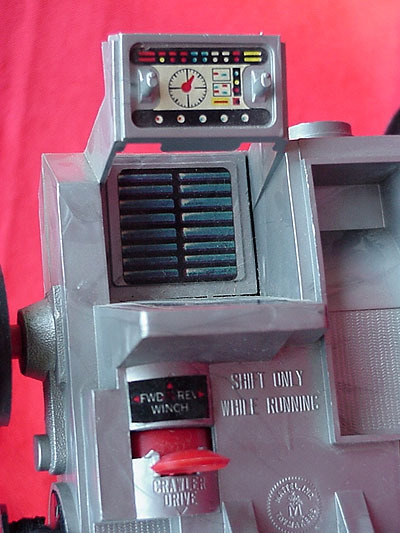 Often you can find one that works but is missing parts, and use the good parts from the non-working one to make it go "wrrr...wrrr...wrrr" again. Turn the crawler over and remove the 6 screws. 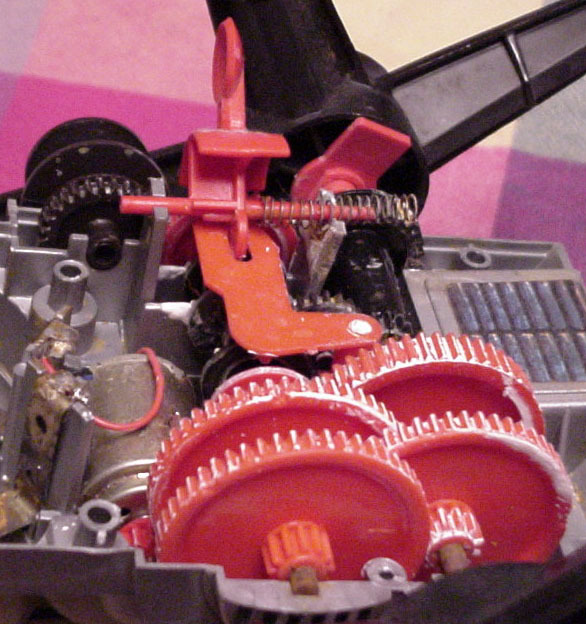 Carefully pry the two halves apart (rest the body, upside down, on a cardboard box that is just wide enough to suppor the Crawler, but allowing the spoked-wheels to rest freely to each side), paying special attention to the winch lever, as a ball-point-pen sized spring is supplying tension to it. The spring often flies across the room... make sure you are in a clean environment, so you can find the durn thing when it goes bye-bye. Often the spring will hit you and bounce, making it even more difficult to locate. 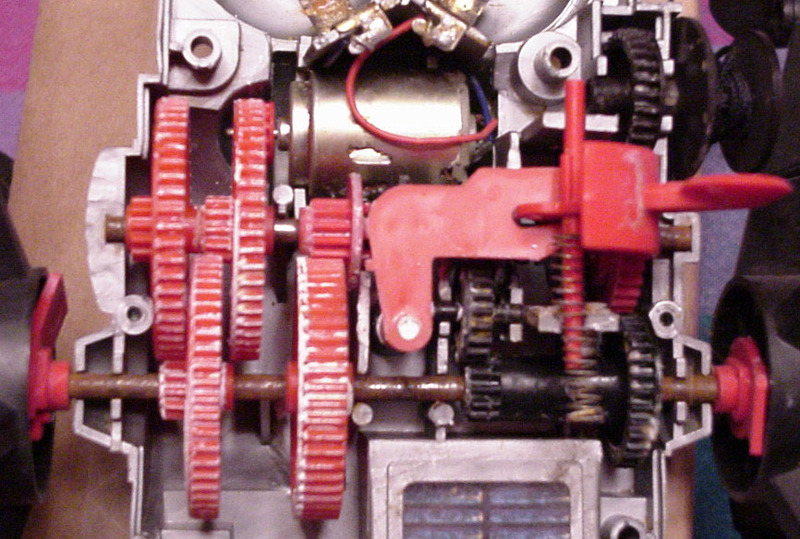 Look at the "guts"... if the gears are all worn off... put the thing back together and look for another. If everything looks almost new, it's probably the motor. Look at all the wire contacts and see if anything has worked loose. Solder the wires back if they have. 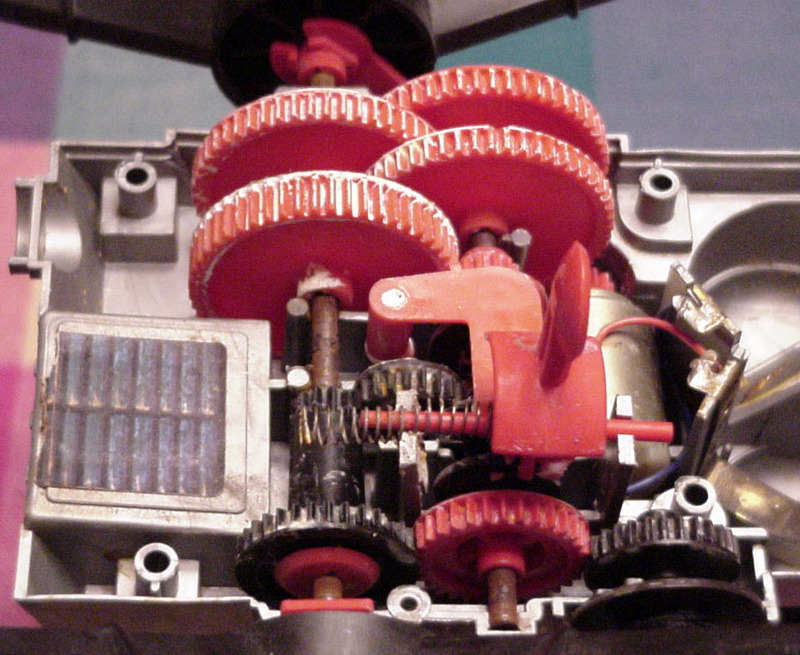 If this doesn't work, carefully remove the motor, after taking some quick notes about where all the gears are placed. I've included some images of thecrawler guts (links are at the bottom). Test the motor by placing the ends of the wires against a battery or two. If the motor still doesn't work, look to see if the brushes are clogged up with muck. They may be cleaned out with a bit of patience, but once again, it may be easier to simply replace the beast. A replacement motor may be found at Radio Shack... look for one the same size that uses 3 volts of juice (2 D Batteries), or whatever it takes. You may have to place some type of spacer to make up the difference in size. Once you have a good motor, the hardest part is reassembly. Be careful to line everything up and make sure that the teeth on the gears and cams line up. When fitting the bottom back on, gently work it until everything lines up. Don't force this.. it takes some patience to figure out when the two halves are aligning properly. The hardest part is keeping the spring from flying across theroom as you're getting the cover on (see below for Toby's trick). Do a couple and it finally becomes easy. That's about it. It isn't rocket science, but may look to be so to the uninitiated. * Note that the spring is supposed to be behind the "fingers" instead of stretched across them. I made an interesting discovery that some of you may already know, but may be helpful to the many folks that don't. I was messing around with a Space Crawler that is in excellent condition, but barely had enough power to pull its own weight. Therefore, I thought I would replace the motor. 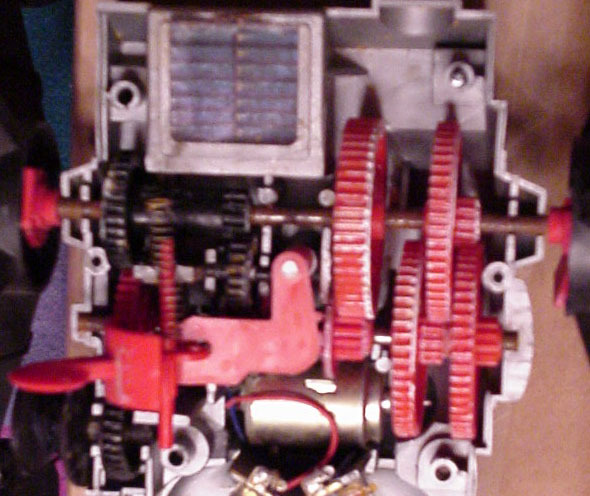 Well, the motor I found at Radio Shack was a little too short and I didn't want to do any modifications. So, instead, I decided to take the original motor apart and see if it could be repaired. I tell ya, that little motor is a marvel of simplicity. I took it apart and immediately saw the problem: the part that the brushes ride on (the commutator) had a coating of old dried-up lubricant. This hardened grease was not allowing good contact between the brushes and the commutator: therefore, hampering the transfer of electrical current to the inner workings of the motor. I cleaned the grease off, re-lubed the bushings that the motor shaft ride on and reassembled the motor. After putting the crawler back together, I slapped in some batteries and ... whamo ... that crawler ran like it was brand new. It made my day! So, if anybody has a crawler (or any other MMM motorized vehicle) and is not intimidated by mechanical things, disassemble that motor and give it a cleaning. 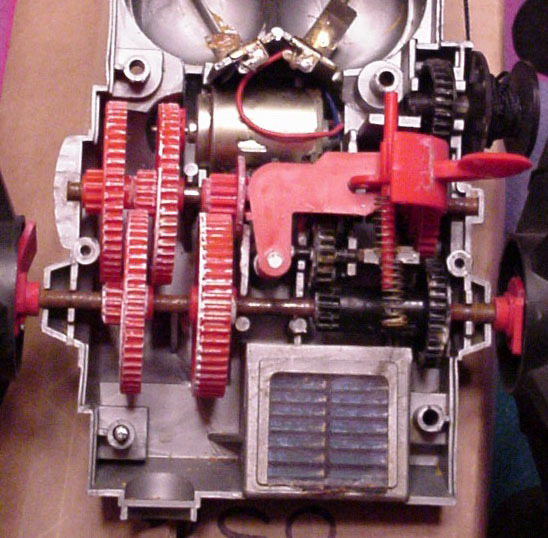 If you've never seen the inside of a crawler, it has a pretty elaborate transmission. Be careful and take your time during disassembly. If you need any further info about the motor, please feel free to contact me. This brings me to this next little neat trick I discovered. For anyone who has wrestled with that spring loaded shifter mechanism when putting the bottom and top of the crawler together and who has had that spring shoot out like a missile, try this little remedy. Slip a small (and I do mean small) washer on the end of that shaft to help hold the spring in place. The washer helps you hold the spring back during installation of the shifter and it helps to stabilize the spring after assembly so you can get the crawler body back together. I know this post is long, but I know there are a lot of weak crawler motors out there. It is a shame throw away an original motor that could have been easily repaired. I hope this bit of info is helpful to someone. As stated above, we make no guarantees of any of these cleaning and restoration techniques and provide a listing of what's been tried as a service only. Try these procedures at your own risk. Finally, should anybody reading this have any similar information, additions or corrections, then we would very much appreciate hearing about them. All Mattel images and captions are copyright Mattel and used without permission. All other content, including images and editorial is Copyright © 1997-2018 John Eaton or Toby Dehnam. If there are any comments or objections, please contact John Eaton, by clicking here or Toby Denham by clicking here.